you can take a photo from app inventor how to return and have the name of the photo to open it later if necessary? I know how to start the camera but then you have to take the picture manually while I would like to know if you can shoot without opening the camera. Thank you. This inability to capture the name of a photo is a SERIOUS limitation in AI2. There is no Camera.SaveImageAs. Your photo, is saved using an arbitrary number.jpg image in the Downloads folder. and assign a specific name. You can not do that with Camera. what files exist. Therefore you can not specifically use this control to delete a file unless the name of the file is saved somewhere within your app (or you remember the name). So, you cannot use the File component to manipulate the photos you take with Camera, that is you can not retrieve them or delete them without using a file manipulation app or using the app on your device to view photos and view/delete from the images posted in that app. way with stuff stored on your Android device using native AI2. while I would like to know if you can shoot without opening the camera. and LOTs of others. Sorry, these are not Blocks.... but with your imagination and some effort, they could be. how to return and have the name of the photo to open it later if necessary? but I do not want to have to press another button to take the picture I want to take the picture by clicking on the button of my app in app inventor make myself clear? Yes, I understand your question, some others here do not. Both you and I expect others to read our posts carefully and are grateful when one answers the parts of queries they are capable of answering. It is a courtesy but not so when other parts of the comments are ignored. In my opinion, the AI2 Camera tool is a basket case. The only way to " press another button to take the picture I want to take the picture by clicking on the button of my app in app inventor" at present would be to use a java script, it that is even possible. Taifun's solutions do NOT answer your questions about these tools or mine. Using the TinyDB as a way to store the images for retrieval i awkward and provides little flexibility You can use the method he proposes or use a different compiler (as I do when AI2 does not yet have a required feature). it can do a reasonable job of allowing one to develop an app whether otherwise it would be impossible because of lack of programming skills or simple tools to do so. If you have to code an app to do what you want, you must either learn to program in Java using Eclipse or Android Studio. Both are free of charge compilers. Alternatively there are other compiling tools that do not use Java..a difficult language to code in. A very inexpensive compiler that most AI2 users can easily 'graduate' to is one called Basic4Android. B4A uses a language very similar to the Visual Basic language used in Windows but it is used to create Android apps. You can do exactly what you want to do in Basic4Android. I have seen a beautiful app coded by a friend that does just that, it takes a picture by just pressing a button in the app. No intermediate steps. With the App Inventor built-in camera component it is currently not possible to take pictures programmatically without user intervention, see also issue 323. I now created the Java app Take Picture as workaround for issue 323. You can start it from within App Inventor with the Activity Starter to take a picture (without shutter sound) programmatically. 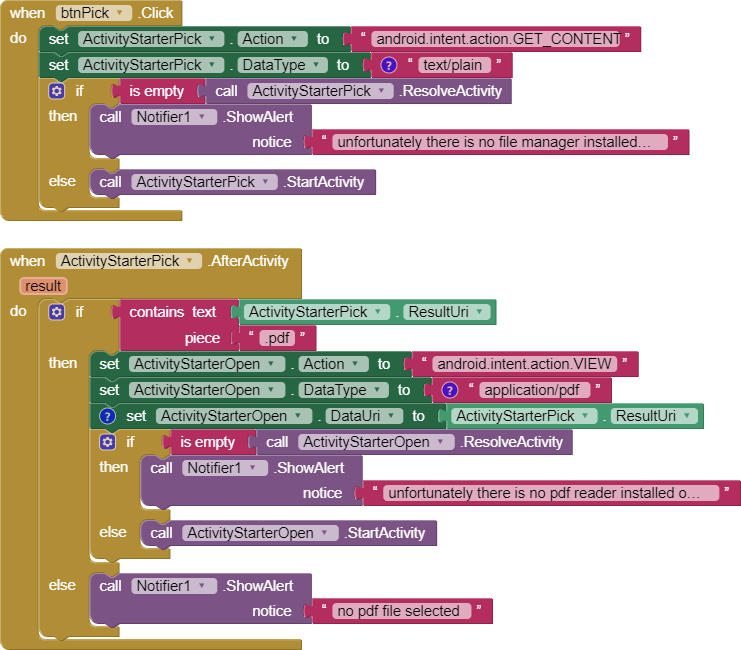 The path to the image will be provided in the ActivityStarter.AfterActivity event back to App Inventor. Could you write up exactly how the camera component should behave and I can try to find someone to work on it. Thanks. You might also have a look at the Camera.java in the sources. You'll see there's not much there. I will do that. I will also comment on issues related to not being able to capture the contents of folders with File etc. You can not delete unless you know the names of the files nor can you load images saved by Canvas and/or Camera ... without resorting to TinyDB, lists and other convoluted procedures. Nice tools, but not fully fleshed out.